Church by the Pond is literally a church without walls. Services are held outdoor in Bushnell Park at 2:00 p.m. every Saturday, rain or shine, hot or cold, sleet or snow. Based on Boston's "Common Cathedral" model, we don't wait for people to find us. Instead, we set up our altar in a highly visible public setting. We participate in God’s mission by bringing the good news of Jesus Christ’s love and salvation to the all people. Our celebrants are Episcopal and Lutheran clergy from the greater Hartford area. They preach and share the Eucharist with those who come together for worship. Our lay ministers are from the community that gathers to worship and they help set up the altar, offer prayers and assist with the distribution of communion. Our Dean and Priest for Pastoral Care supports our participation in God’s mission by being present at Bushnell Park on Saturdays to welcome our clergy from ECCT and ELCA at Church by the Pond and serving those in need. They also celebrate and preach from time to time. We believe that God loves and created all people in God's image. We are all God's children and greet each other as brothers and sisters in Christ. From 20-60 people typically gather for the service every Saturday regardless of the weather. Many are homeless and living in shelters. All come to hear God's Word, most seem to feel the comfort of the liturgies they learned as children, and nearly everyone participates in the sacrament of Christ's Body and Blood. Nearly 25 clergy from around the state participate. Most are deeply moved by the experience of serving God by serving the least of our brothers and sisters. They return, often with their parishioners who make and distribute 75 or so bagged lunches after the service. Try it. You'll like it. The liturgy is a shortened version of The Holy Eucharist Rite II from the Book of Common Prayer. 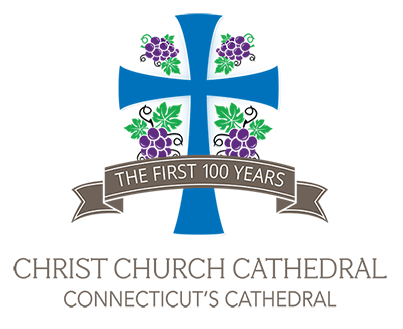 It has been approved by the Episcopal Diocese of Connecticut and the bishops have celebrated many times in Bushnell Park. To read the altar copy, click here and to see the participant handouts, click here. We hope you'll want to join this ministry of Jesus Christ. Let us know if you have a question or need information. Send us your comments on the "contact us" page. We're an "ecclesia ministry" in that we're a church without walls. 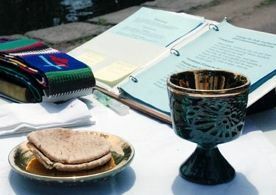 Our services take place in an open space near the carousel in Bushnell Park, Hartford, and every Saturday afternoon at 2 p.m. We proclaim the Word of God and celebrate the Holy Eucharist to whoever stops by. We're a ministry of Christ Church Cathedral but our preachers and celebrants come from churches throughout Connecticut. Jesus said, "For where two or three gather in my name, there am I with them." That's where we are, too. If you want to see what our services look like, click on the "photos" page. If you want to know more about our liturgy, click on the "services" page. If you'd like more information, check out the "contact us" tab. We invite everyone to take part in this celebration of God's love and of God's dream for all God's Children. Our Lay Coordinator Nancy Jacobs and a Cathedral clergy person (Dean Miguelina Howell or the Rev, Jay Cooke) will be onsite nearly every Saturday. Clergy and others will set up the altar, pass out bulletins, gather prayers of the people, set up the sound system, and answer any questions or concerns. After the service, a church or community group will distribute bagged lunches. Expect the unexpected. We're in a public space so sometimes a parade will march by or UCONN fans will come through celebrating a victory or families will walk through on their way to a birthday party. It's all good. The Very Rev. Miguelina Howell is the primary Cathedral clergy person for Church by the Pond. She serves at nearly all services and welcomes any questions you may have. Contact her at [email protected] Nancy Jacobs is our lay coordinator of Church Street Eats at Church by the Pond. Nancy Jacobs is our lay coordinator of Church Street Eats at Church by the Pond. She schedules groups to bring lunches to Bushnell Park and assists groups and guests receiving lunches and other donations.